My mom came over this evening to bring us leftovers from our family's Thankgiving dinner. She mentioned that she had checked the blog this morning hoping for a Thanksgiving post, and was disappointed not to find one. I told her that I didn't really have anything new to write about, so I hadn't gotten around to it yet. I think it was John who said something to the effect that I could write about what I am thankful for. I went through the whole day without even thinking about that... I have a LOT to be thankful for. I've been spending way too much time lately wrapped up in day to day life and feeling sorry for myself because life has been rough this past year. To cheer myself up, in the true spirit of Thanksgiving, I am going to spend some time writing about what I am thankful for. I am thankful for my children. 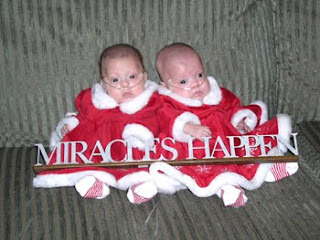 Before Holland and Eden were born we were told that 24-week preemies have about a 50% chance of survival. Sometimes I forget how very lucky we are to have BOTH of our babies. I never want to take their lives for granted. 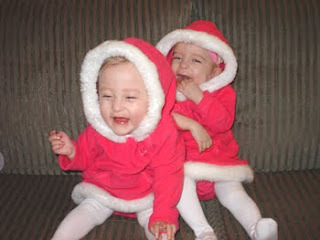 They are the most beautiful little girls I have ever met. Their spirit and personalities brighten every day. They have such character and are full of love and laughter. Everything they do just amazes me. I am thankful for my husband. In July we celebrated our 7th wedding anniversary, and in October, our 12th anniversary as a couple. John is my very best friend and is always there for me when times get tough. He puts up with my moodiness, crying, and bitching, and loves me anyway. He is a strong, solid presence in my life through every up and down and I would be lost without him. In addition to that, he's really cute, really smart, and really talented. He's also an amazing father, and the love that he has for our girls makes me love him even more than I thought possible. I am thankful for my mother. When I was in the hospital she was there for me every day and every night. She visited the girls in the NICU almost every day. Over the past 16 months she has continued to help me out anytime I need her. She watches my kids when I work and she finds a way to come to any doctors appointments when I need her. Sometimes she even cooks for me and cleans my house! My mother's love for me is unconditional and I only hope that I will be as good a mom to my own children. Thank you mom, for everything you do for me every day. I love you. I am also thankful for my father, sisters, and brother, as well as my in-laws, and my amazingly cute and smart nieces and nephews. They are all so thoughtful and kind, and would do anything for us. I am beyond lucky to have such a wonderful family. I am thankful for my friends. Most people are lucky to have one or two good friends in a lifetime. I am lucky to have many more. I still keep in contact with friends from elementary school through high school, college, graduate school, and work. I am surrounded by strong, smart women who listen to me, support me, and love me. They have continuously offered help in many, many ways. I am most grateful that I always have a shoulder to cry on. An occasional girls night out to lift my spirits and drown my sorrows doesn't hurt either:) I have the best girl friends! There are other things in life that I am thankful for, such as the fact that we have good jobs and are able to have a nice house, and clothes, and money to live comfortably. I am also thankful for my health, and the health of my family. But most of all it's the people in my life that I am thankful for. Life is full of uncertainty, ups and down, and occasional boulders in the road. When you have people in your life to love, and who love you, I think you can handle life...whatever it may throw at you. Thank you very much for your very touching letter in Thanksgiving ! Now I really know the meaning of Thanksgiving Day ! We thank you for a very nice and wonderful post with full of love, careness and kindness ! With best regards to your family ! P.S. Girls..you are da bomb! Happy Thanksgiving! What a sweet post! Billie, you should write a book someday about your experiences (in your free time, right? ); you are so good with words. You are a beautiful person. Thank-you so much for inspiring so many mothers to put our best self forward for our husbands, children, and each other. I am very thankful for having such an awesome woman for a sister-in-law. The girls are getting so big and look at how happy they are! You are a great mom, wife, daughter and all and it shows in the girls beatiful smiles. Wow. Anyone that reads that and doesn't find things to be thankful in their own lives has a serious problem. That was inspirational! I've learned through the years that a person can live through many hardships if they keep a grateful attitude. Thanksgiving is a good time to sit down and "ponder" the blessings we have. I've enjoyed having the chance to "see things through your eyes" by reading your blog and I think it's a great way to learn as well. You've done a good job of educating us about the twins' conditions. I keep you and yours in my prayers. Surely, "miracles do happen"